If you’ve never summoned the will to ask for a raise, you’re definitely not alone. Fifty-six percent of people have never asked for a raise, and 49 percent of new employees accept the first offer they’re given without negotiating, according to CareerBuilder.com. If you’re one of those people, TODAY financial editor Jean Chatzky has tips on how ask for that raise, negotiate to get what you’re worth and earn more money as part of the #StartToday series helping you begin 2016 with resolutions for your home, body and wallet. Whether it’s fear of rejection, fear of being fired, or a feeling of not being good enough, many people shy away from negotiating higher pay. 1. Know your value. Sites like Glassdoor.com can help you figure out what employers are paying people who have similar credentials to yours. 2. Prove your value. Whether you’ve boosted sales, increased the company’s social media presence or identified a new market, document how you’ve added to your company’s bottom line. 3. Timing is everything. Make your request for a raise at the time of year when your employer evaluates its employees and their pay. 4. Have other asks ready. If your company is struggling financially, identify things like extra vacation or more flexibility that you could ask for instead of more money. Chatzky also offered other potential avenues for increasing your income. 5. Switch jobs. Leaving typically gives you a salary bump of 10 to 20 percent, compared to an average raise of 3 percent, according to business management consultants Towers Watson. To maximize your talent, it’s best to switch jobs every three to four years if possible. 6. Get another offer. 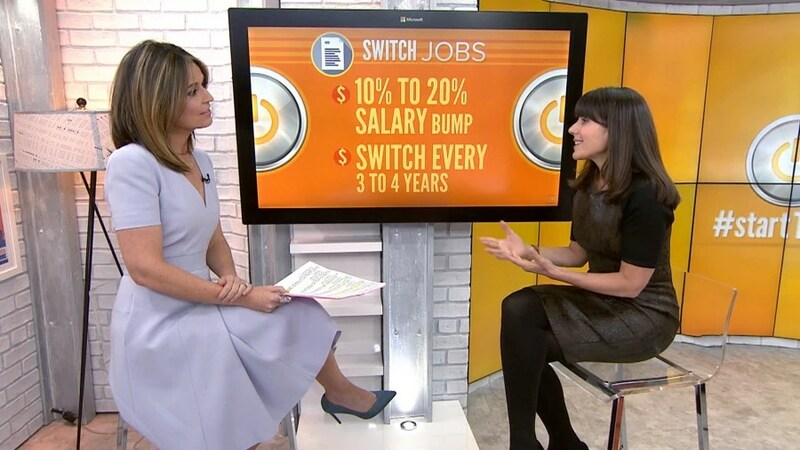 You have to be willing to switch jobs if your current employer doesn’t want to match a competing job offer, and you usually can only use that tactic once per employer. 7. Find a side hustle. One-third of Americans work multiple jobs, so whether it’s selling your free time by running errands or babysitting, or renting out your car, bike, tools, etc., when you’re not using them, there are numerous online companies to help you make some cash on the side.